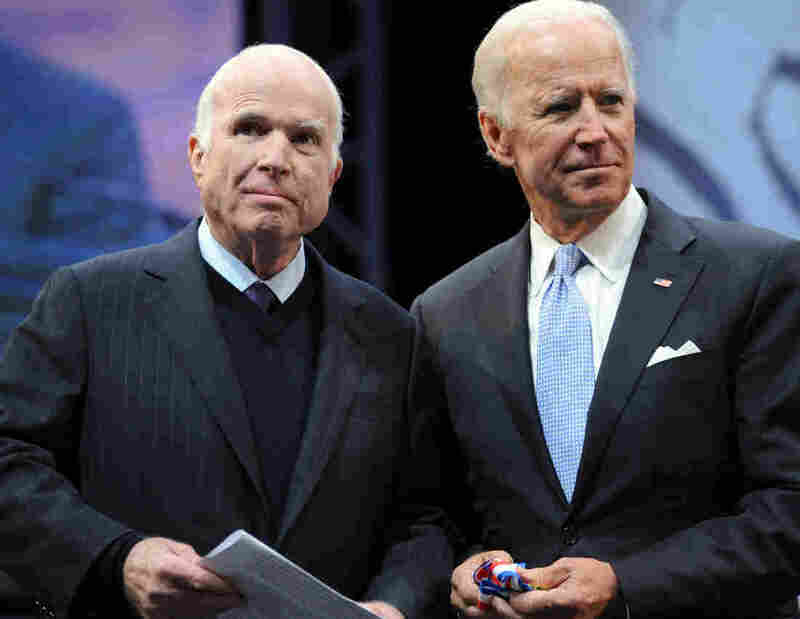 McCain Pallbearers Include Joe Biden, Warren Beatty, Russian Dissident, Professional Athletes Former Vice President Joe Biden, actor Warren Beatty, two legendary Arizona athletes and a Russian dissident are among several pallbearers at ceremonies honoring the late senator this week. Jack McCain, son of Sen. John McCain, R-Ariz., touches his father's casket during a memorial service at the Arizona Capitol on Wednesday in Phoenix. The late Sen. John McCain, R-Ariz., will be laid to rest this week after a series of memorials and ceremonies in Arizona and Washington, D.C.
A public service is set to take place Thursday at North Phoenix Baptist Church in Phoenix. Former Vice President Joe Biden will deliver a tribute, and two of McCain's children, son Andrew and daughter Bridget, will offer readings from Scripture. Arizona Cardinals wide receiver Larry Fitzgerald Jr. — who became friends with McCain after his NFL career began, and who recently wrote a piece for Sports Illustrated on his admiration for McCain's service in Vietnam — is also slated to give remarks. McCain's body will then lie in state at the U.S. Capitol on Friday before a ceremony at the Washington National Cathedral on Saturday, where tributes will be delivered by former Presidents Barack Obama and George W. Bush, and McCain's daughter Meghan, among others. Sen. Lindsey Graham, R-S.C., will offer one of several Scripture readings set for the D.C. service. 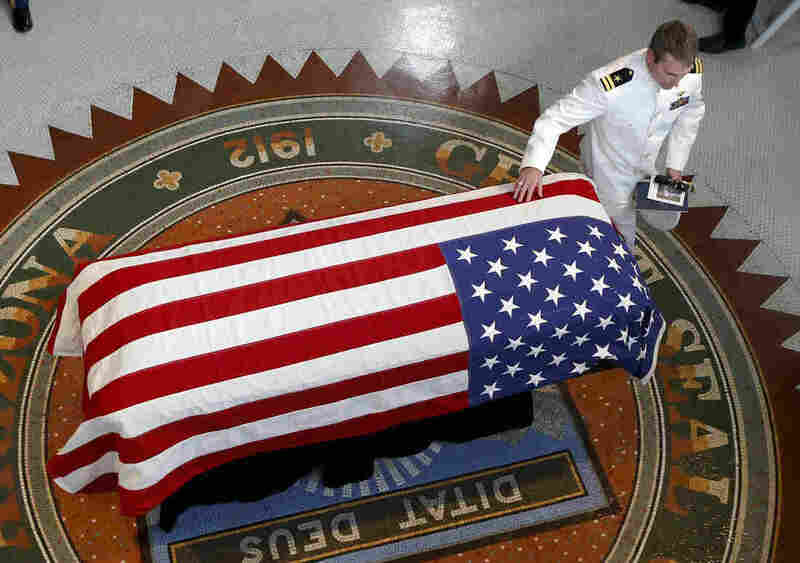 On Sunday, McCain will be interred at the U.S. Naval Academy Cemetery after a private ceremony Sunday at the Academy Chapel in Annapolis, Md. The private ceremony will include tributes by Graham and McCain's son Jack. Another McCain son, Douglas, will offer a reading of Scripture at this ceremony. In addition to tributes and Scripture readings, a host of lawmakers, former aides, friends and family members are set to serve as pallbearers at the various services honoring McCain. Here's a look at some of those individuals. McCain's career in elected office spanned 35 years, from his first election to the House of Representatives in 1982 to his three decades serving in the U.S. Senate. Six former Senate colleagues of McCain will serve as pallbearers during the ceremony at Washington National Cathedral: former Sens. Biden, William Cohen, Gary Hart, Russ Feingold and Phil Gramm; and Sen. Sheldon Whitehouse, D-R.I.
Biden and McCain held a decades-long friendship throughout their Senate careers, and in an interview alongside Meghan McCain last year, Biden described her father as "one of my best friends." Feingold, meanwhile, grew close with McCain during their work on bipartisan campaign finance legislation that worked to rein in the influence of big-money donors on American politics. Former New York City Mayor Michael Bloomberg, former Homeland Security Secretary and Pennsylvania Gov. Tom Ridge will also serve as pallbearers at the Washington National Cathedral service Saturday. Defense Secretary James Mattis will serve as a pallbearer at the private Naval Academy service Sunday and former Arizona state Rep. George Weisz will serve as a pallbearer at Thursday's church service in Phoenix. Sen. John McCain, R-Ariz., receives the Liberty Medal from former Vice President Joe Biden (right) in October 2017. Biden is one of many pallbearers who will serve at ceremonies honoring McCain this week. Two professional athletes with deep ties to Arizona sports — Luis Gonzalez and Shane Doan — will serve as pallbearers during McCain's Arizona ceremony. Gonzalez is a retired Major League Baseball outfielder who played eight seasons with the Arizona Diamondbacks from 1999 to 2006. He told TMZ Sports that he and McCain had been friends since his playing days and that he was "blessed and honored" to be a pallbearer. Doan played for 21 seasons for the NHL's Arizona Coyotes, dating back to their days as the Phoenix Coyotes and the Winnipeg Jets and is the franchise's all-time goals leader. "Senator McCain was a shining example of what a modern leader should be," Doan said in a statement released by the Coyotes, adding "I am so honored to have been able to call Senator McCain my friend, and am grateful to his family for allowing my family to be a part of their lives." The actor and filmmaker Warren Beatty will also serve as a pallbearer during the ceremony in Washington, D.C. The two men were friends for decades, and according to The Washington Post, shared a common passion in campaign finance reform. Russian dissident Vladimir Kara-Murza is among the pallbearers for the D.C. service. 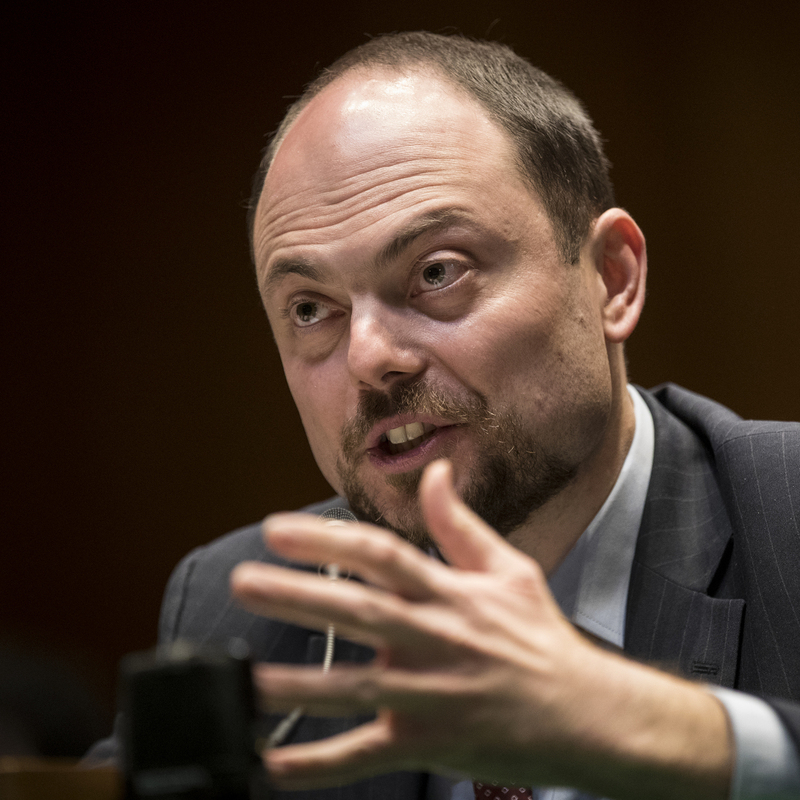 There's another notable name included among the pallbearers for the D.C. service: Vladimir Kara-Murza, a Russian dissident who serves as vice chairman of Open Russia, a democracy and human rights advocacy group with headquarters in Moscow. Kara-Murza told Politico that he was"speechless and heartbroken, close to tears at that moment" after a mutual friend brought him a personal message from McCain in April asking if he would consider serving as a pallbearer. "I said yes, of course, and that it would be the most heartbreaking honor that anyone could think of," Kara-Murza said. A number of McCain's former legislative and campaign aides will also serve as pallbearers during the various ceremonies. From his 2008 presidential run, strategist Charles Black and national campaign manager Rick Davis will join McCain's former chief of staff Mark Salter, legislative directors Joseph Donoghue and John Raidt and Senate administrative assistant Chris Koch as pallbearers. Seven family members will serve as pallbearers during McCain's ceremony at the U.S. Naval Academy: grandsons Andrew Jr. and Shep; granddaughters Caroline and Margaret; sons Andrew Sr. and Douglas; and son-in-law Ben Domenech, publisher of The Federalist.